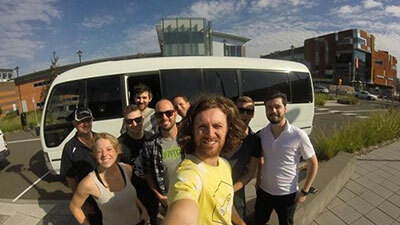 The start-up bus brought around 30 young start-up enthusiasts from Sydney and Wollongong to the Bega Valley to participate in the Sea Change Start Up Camp. Image courtesy of Tim Mahlberg. In mid April the Sapphire Coast Science Hub presented a week long Innovation Festival in the Bega Valley. Organised by IntoIT, a local not for profit dedicated to promoting technology fuelled business growth in the region and supported by Inspiring Australia, the Festival attracted business owners and starts ups from across NSW and the ACT, with delegates coming together to find creative ways to boost skills and jobs. The festival began with a Regional Technology Decision-Makers Forum featuring local entrepreneurs, science and technology enthusiasts and business leaders. Festival founder Liam O’Duibhir described the week as an important opportunity to highlight the potential of entrepreneurship and digital technology in the lives of locals in the Bega Valley region. Liam and his colleagues are convinced that the Sapphire Coast region can host more career opportunities for young people than the established dairy, tourism, oyster and other primary industries. He has established many initiatives to help develop and share regional IT skills and knowledge, including free coding nights, the COWs By the Coast co-working space and regular networking sessions. Liam also advocates for the need to build rich and creative cultural experiences in the region to make it a more attractive lifestyle destination for sea changers. Representatives from local councils added their voice to paint a picture for how the Sapphire Coast region can diversify its skilled workforce to take advantage of digital opportunities that potentially could attract more skilled people to the region who will go on to create new jobs. Clothing retailer and Birdsnest CEO Jane Cay shared the success story of her online fashion label that began as a clothing emporium in Cooma and now employs 100 people. Jane spoke about the need for better training services and the need to keep educating her staff in innovative digital and business trends. Other participants shared examples of how they attract and retain skilled technology talent. The partners behind a fast-rising local startup, Crowd Carnivore that takes small farm, grass fed beef from the paddock direct to the consumer, shared their insights about using design and technology to build markets and drive sales. A session on the Future of Code. For the sixth year running, a weekend Sea Change StartUp Camp brought together local community members, business advisers and IT experts to create new ideas. Guests included Sarah Pearson from Canberra Innovation Network, Aiden Coleman, CEO of Bega Cheese, Max Kaye of the FLUX Political Party and Jade Moxey, Australian Young Scientist of the Year. More than 30 people travelled to the event from Sydney’s Fishburners start up hub to participate in a hackathon including Tim Mahlberg, from University of Sydney’s Business School. Tim was part of the 24 hour hackathon that saw teams and individuals battle it out to take out the title of Chief “Bush hacker”. They worked on range of innovative projects that could be taken from idea to prototype in just one day. “My favourite ones were a Wifi-enabled Laser tag game, and a multi-player VR game where you defend a virtual fort as your friends ‘attack’ you on their mobile phones; all displayed on a big screen,” said Tim. Each proposal was assessed by the judging panel consisting of business heavyweights and entrepreneur mentors. There were several prizes to be won, but once the pitches were finished, Anna Pino of Lighthouse Innovation in Canberra was so impressed by the Paw Prints team she offered them a bonus prize, $3000 worth of consultancy in addition to other prizes worth $3,000. Joining around their passion for pets, Team Paw Print is an idea conceived by four young women for a website and app to create a personal pet profile that contains medical history including what medications the pet takes and recent vet visits. The site will also have a postcode search component to inform the owner of possible risks in the area such as ticks, snakes, fox baiting or diseases. Tim was particularly inspired by meeting locals with the same passion and enthusiasm for innovation to be found in Sydney’s incubators, including Libby Hepburn, who convenes the Sapphire Coast Science Hub, the Atlas of Life in the Coastal Wilderness and is a board member of the Australian Citizen Science Association. “She works on citizen science initiatives designed to engage the local community in scientific experiments and observations – so cool,” he said. Congratulation to Liam and all his colleagues for the success of Australia’s first Regional Innovation Festival. The momentum will keep going with regular events presented by IntoIT and Cows by the Coast. IntoIT is a member of the Sapphire Coast science Hub supported by Inspiring Australia.